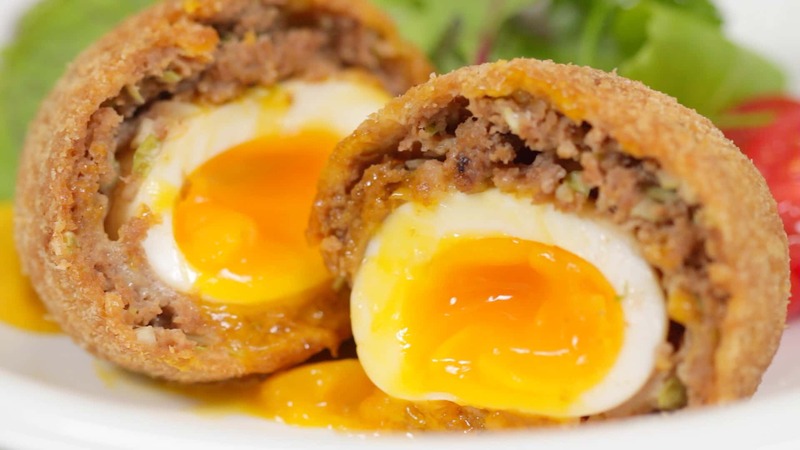 Let’s make hearty Japanese-style Scotch Eggs, in which half boiled eggs are wrapped in ground meat, breaded and deep-fried. The combination of the crispy outside and the gooey inside is so delicious. These are great for Christmas dinner. You should definitely try it out. Let’s make the half boiled eggs. 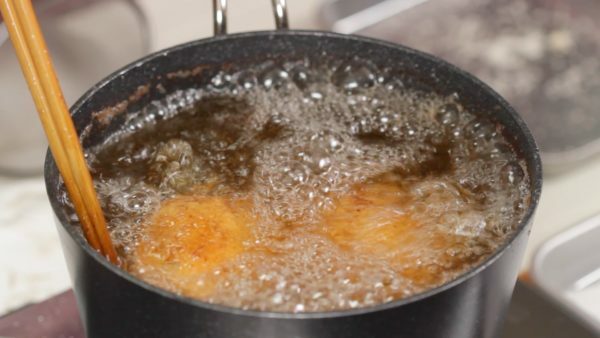 Reduce the heat to low and carefully place 2 eggs into a pot of boiling water. During the first 2 minutes, gently rotate the eggs to help the yolks to stay in the center. 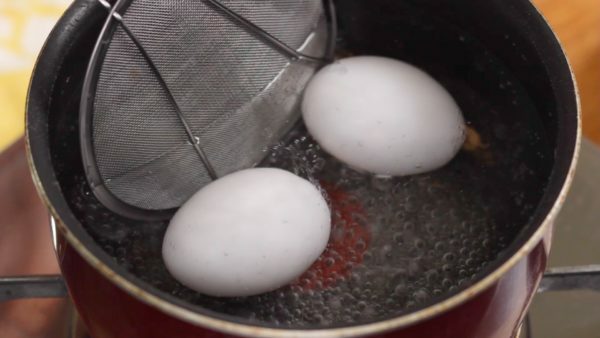 Boil the eggs for a total of five and a half minutes. 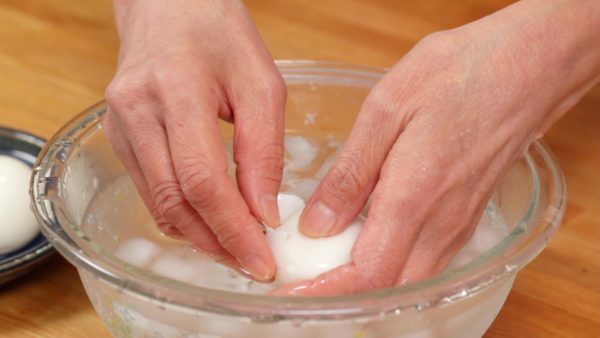 Place the eggs into a bowl of ice water. Remove the shells in the water. The eggs are soft and delicate so be careful not to break them. Look at that! The soft-boiled eggs have a jello-like texture! 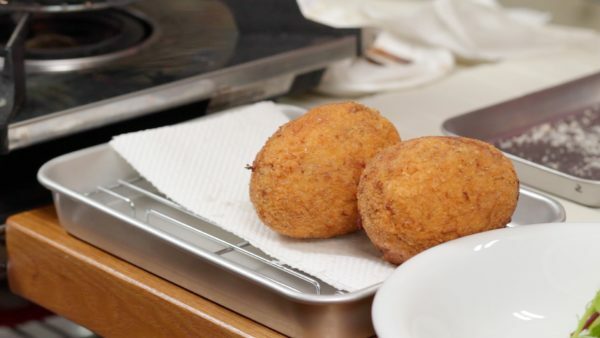 Let’s make the scotch eggs. Add the breadcrumbs to the beaten egg and stir to moisten. 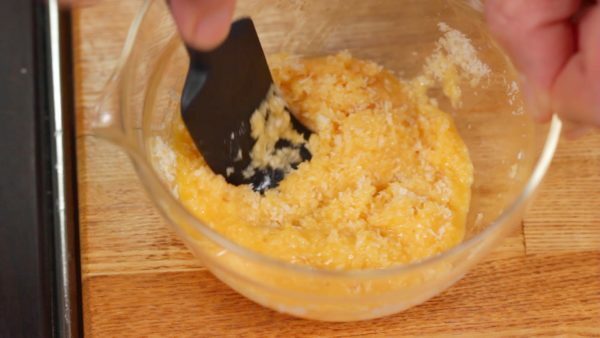 For the batter, combine another beaten egg and the flour in a bowl. Stir to mix. 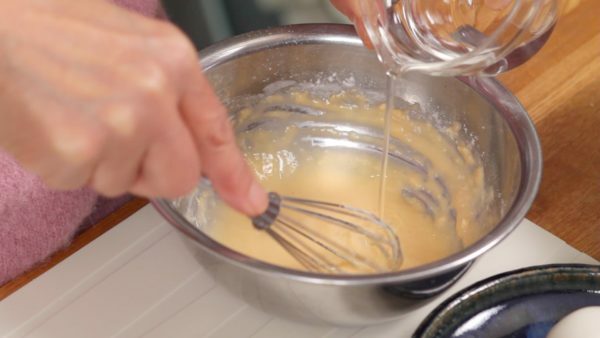 Add a small amount of water until the batter has the desired consistency like shown. Place the mixture of ground beef and pork in a bowl and sprinkle on the salt and the coarsely ground black pepper. Add the Japanese Worcester sauce or regular Worcester sauce and the tomato ketchup. 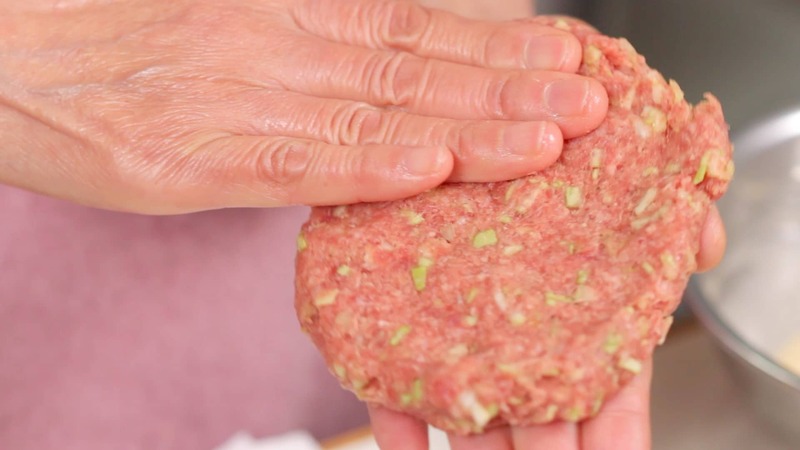 Combine all the ingredients with your hand. 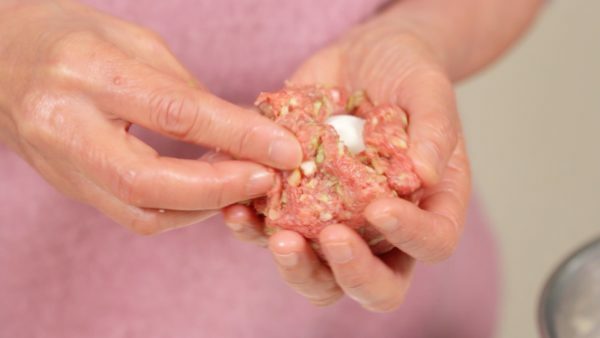 Make sure to thoroughly mix the meat until it becomes kind of gooey. Add the egg-moistened bread crumbs and the chopped cabbage leaves. Combine the ingredients again. Take half of the meat in your hand. Toss it from one hand to the other to remove the air inside. Then, flatten the meat. Dust the boiled egg with flour and wrap the egg with the meat. The flour between the egg and the meat will help to attach them firmly together. Make the thickness of the meat even and shape the scotch egg into a ball. 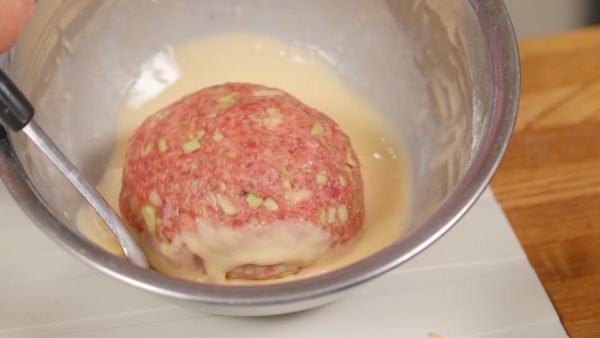 Coat the meat with the batter. Coat it with the bread crumbs. Repeat the procedure and you’ll have 2 large scotch eggs. Let’s deep-fry the scotch eggs. Heat the oil to 170°C (338°F) in a pot. Adjust the shape and place each scotch egg into the oil. Don’t touch them until the batter firms up otherwise the outer layer will break apart. Then, with kitchen chopsticks, gently rotate the pieces to brown evenly. Deep-fry for about 5 and a half minutes until golden brown. 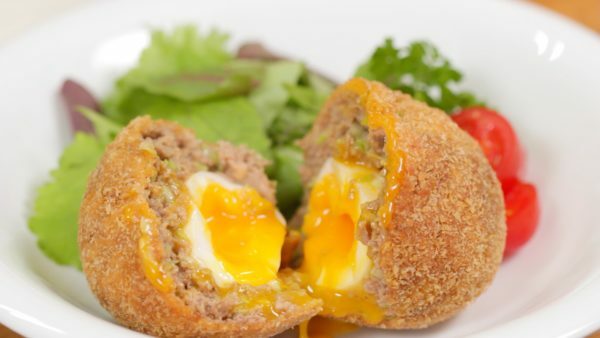 Place the scotch egg onto a plate along with the salad. 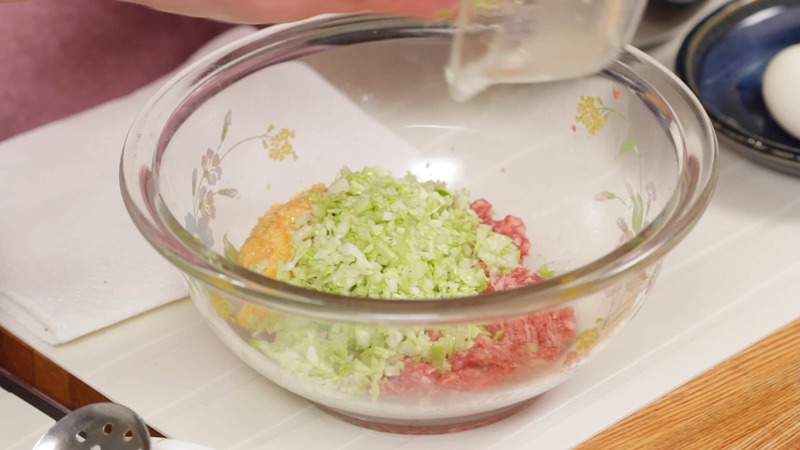 Enjoy the dish with mustard or you can add your favorite sauce to taste. Scotch eggs are an English dish and authentic recipes use a hard boiled egg and sausage meat. This version is inspired by a Japanese dish called Menchikatsu, a breaded and deep-fried ground meat. 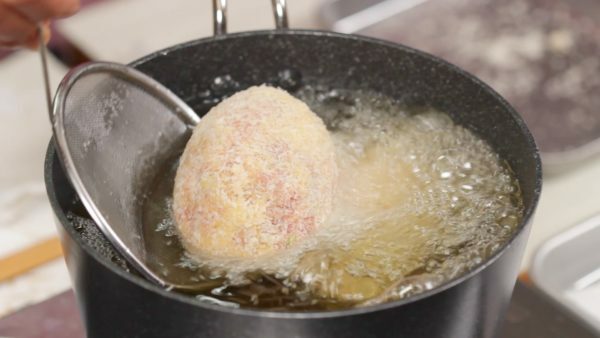 Thoroughly mixing the meat and removing the air inside will help prevent the meat from cracking while deep-frying. 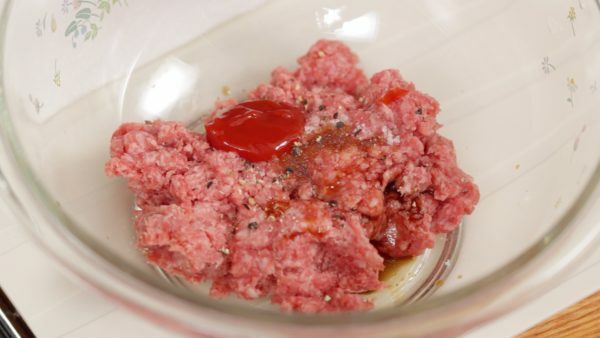 The meat is well seasoned in this recipe so you should be able to enjoy it with only mustard. 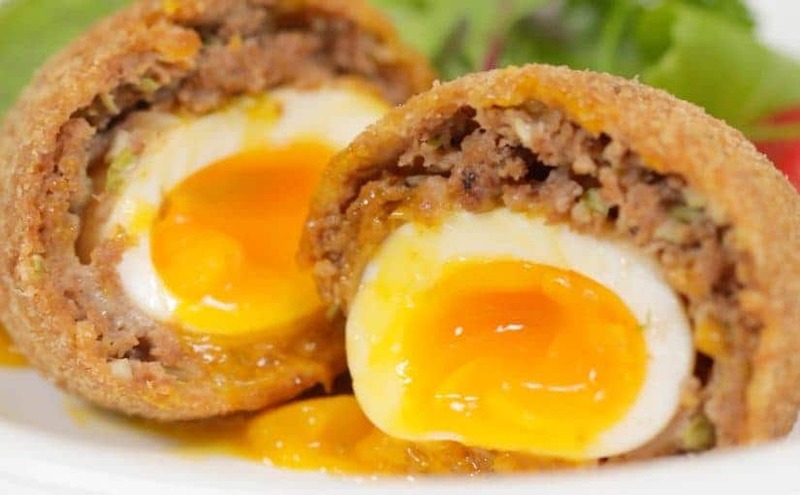 I would like to taste your version of scotch eggs. 🙂 Especially the one with jalapeno instead of cabbage sounds tempting! Thank you for the comment.